I am a writer who spends a lot of time sitting down and was not getting any exercise. I developed an uncomfortable pain in my lower back that just wouldn't go away. I tried asperin, salves and exercise, and finally gave up and decided to live with it. 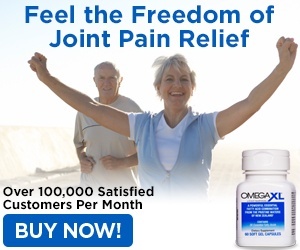 Then I started using OmegaXL and couldn't believe how quickly I felt results. In less than two weeks I was pain free. OmegaXL is definitely working for me. I feel the difference and will continue using the product. I've also been recommending OmegaXL to friends. Review #1032018 is a subjective opinion of User1032018.